A good reminder that life on other planets would not necessarily see space the way we do. Space from our planet generally comes across as quite cold and grey - we have the faint pinpricks of light called stars, a few moving pinpricks of light called planets, a moon to light up the night sky a bit every once in a while, the odd comet, and shooting stars. 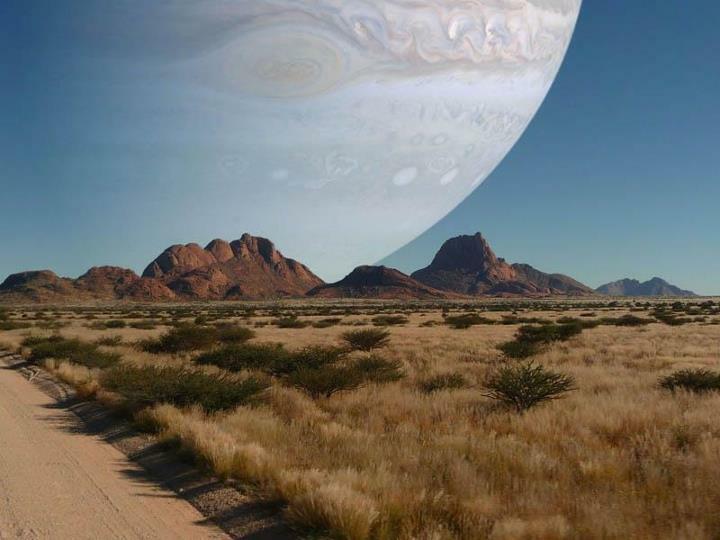 To life on a moon around a gas giant, however, space is your backyard. Instead of looking up at the moon, you are looking down on the gas giant you orbit, making it very hard even without a modicum of scientific knowledge to conclude that your planet must be the centre of the universe. Other moons orbiting the planet would pass by in front and behind, and of course there would also be a sun in the sky. It would be easy to conclude, however, that the gas giant is the centre of the universe and the sun orbits it. And if the moon you are on happens to have a low surface gravity with a thick atmosphere, flying life on the planet will be plentiful, most likely also including the most dominant life on the planet (i.e. their equivalent of humanity), and no era debating whether flying can even be done in the first place will need to exist. Space to them would not be just a vague idea of the upper sky, it would be the part of the sky after which it gets too thin and too cold to fly up anymore. Getting to space would be more akin to our climbing mountains or deep sea diving - not impossible, but not doable for long and requiring a good deal of equipment.